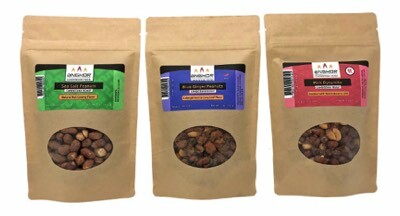 A delicious healthy snack; we hand-select peanuts and roast them in nano-batches, our traditional Cambodian roasting technique intensifies the natural aroma and sweetness of peanuts. Enjoy them as your "go to" healthy snack or incorporate them into your cooking. Nothing but just the right amount of sea salt, bringing out the natural sweet and creamy, slow-roasted flavor. A satisfying snack or perfect for topping your favorite Cambodian dishes. 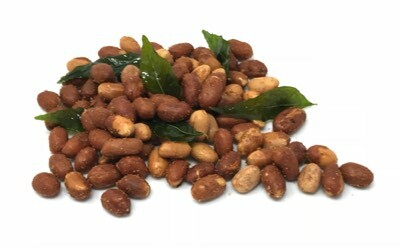 Blue Ginger roasted peanuts are seasoned with a trio of galangal root (blue ginger), curry leaves and chili. It's a delightful and unique WOW flavor that is familiar to all Cambodians! Pink Dynamite roasted peanuts are delicious snack for folks that like all things SPICY! Flavored with habanero chili and Himalayan pink salt; these roasted peanuts never disappoint.